This spring we are growing vegetables in pots in our front yard. 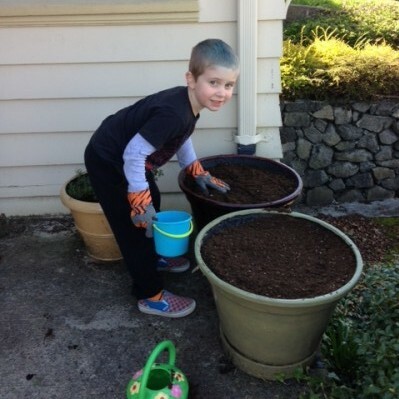 One sunny day in late March, the kids and I freshened up our containers with new soil and got seeds planted. I love having them help with gardening projects. We planted two varieties of carrots, two varieties of peas, and a large pot of mixed lettuces. 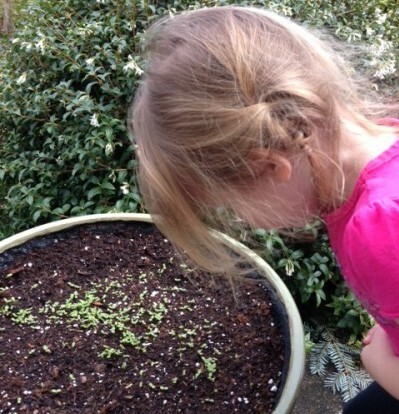 All the seeds have germinated now and we are having fun watching the baby vegetables grow. Once our peas start getting tall, we’ll add some poles to trellis them. Gardening doesn’t have to be a big huge commitment. You can easily throw a few seeds in containers to experiment. I will keep you updated on the progress of our container veggies. Container gardening has its advantages because you can move the pots to sunny locations as needed and because we are moving this summer, we can just take our garden with us! Are any of you growing vegetables in containers this year? 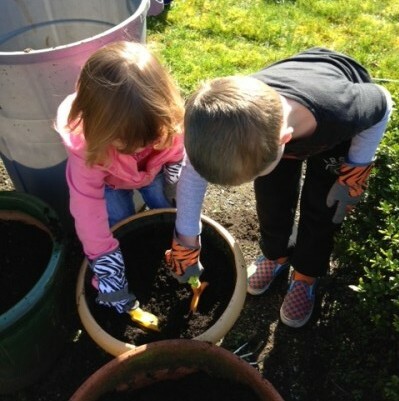 The kids did a great job adding new soil to the pots and leveling them off with their garden rakes. Gavin handled preparing the pots up on the porch. 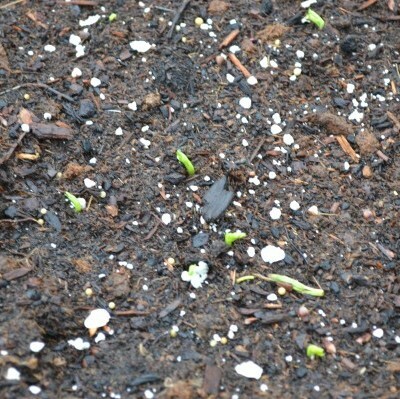 About three weeks later, we have seedlings. The above seedlings are sugar snap peas. 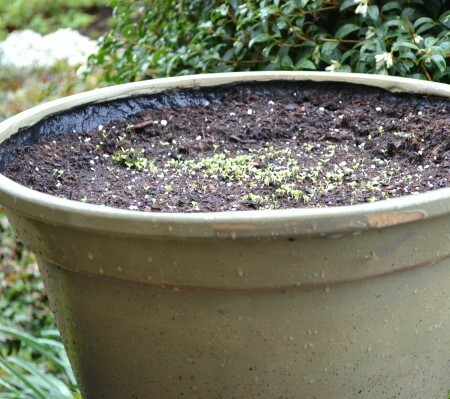 Above is our lettuce pot, which is definitely going to require some thinning once the seedlings get bigger. One of the drawbacks to having kids handle the planting is that many seeds get wasted. But who wants to spoil the fun of throwing handfuls of seeds in the dirt?!? If you want to encourage a love of gardening, it’s important to make it as fun as possible. I have to exercise a lot of patience when having the kids help! I’m growing potatoes in containers, actually more like giant fabric bags. Most of my veggies will grow in beds though. My mom is growing potatoes in burlap wrapped tomato cages this year! I took some photos and plan to write a post about the experiment! We just picked up our tomato starts at Molbaks today, and they mentioned that we should be doing them in pots and moving them into the garage every night until the low stays at 50F or higher. Seems like that will be a long time from now … I’m looking into picking up some of those Wall-O-Water insulators, because we really wanted to put them straight into our garden this year and not use containers. We have such a nice size veggie garden with a lot of room and I want to put the space to use! I love that you have the kids help and let them do it their way. And so smart to plant in containers so you can move your garden with you this summer!